I’m sure you can tell that I’m totally ‘ciked about Halloween. As Shaunsito gets older we can do so much more to celebrate which hubby and I love! 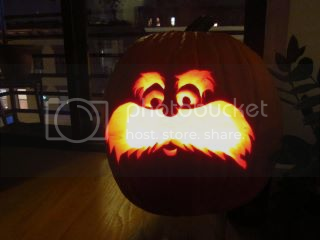 Thanks to some friends I found a Halloween Pumpkin Stencil from the upcoming movie Dr. Seuss’ The Lorax. Very cool! Here’s hoping that when we carve our pumpkin I don’t lose a finger. I’m not that great at it. Perhaps hubby should take over the honors this year. Anyhow, enjoy the stencil, have a wonderful Halloween and wish my fingers luck! 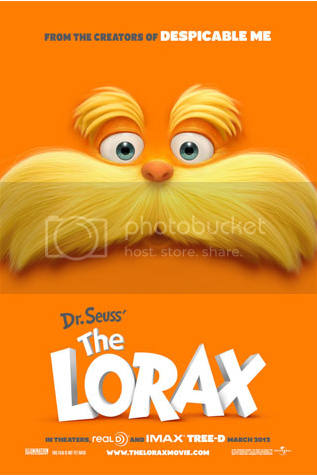 Danny DeVito will lend his vocal talents to the iconic title character of the Lorax, while Ed Helms will voice the enigmatic Once-ler. Also bringing their talents to the film are global superstars Zac Efron as Ted, the idealistic young boy who searches for the Lorax, and Taylor Swift as Audrey, the girl of Ted’s dreams. Rob Riggle will play financial king O’Hare, and beloved actress Betty White will portray Ted’s wise Grammy Norma. Hits theaters March 12, 2012. « Wordless Wednesday – Guess Who? Disney’s Treasure Buddies on Blu-ray, DVD & Digital!